It was a warm winter. 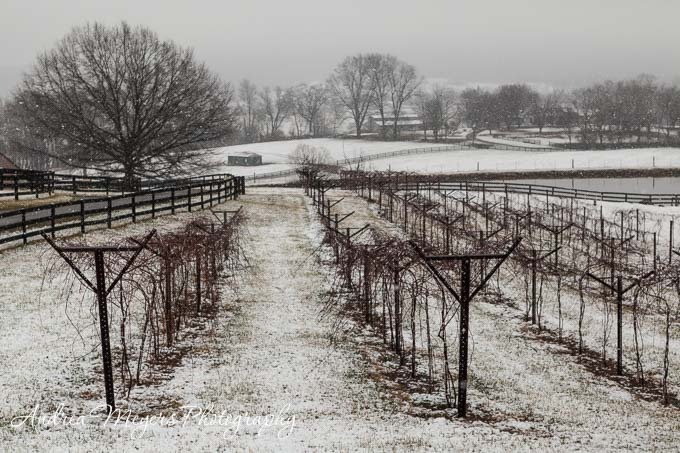 Each time there was snow in the forecast, I would get excited and get my camera gear ready to set out early in the morning to visit the farms, hoping to catch some snow on the ground, clinging to the trees and vines, and resting on the fences. Instead, it would melt as the sun rose each time, dripping off the trees, the sound of each drop a disappointment. Then one Saturday morning late in February we woke up to a dusting of snow that seemed to stick. The temperature hovered at 35° F, so we jumped in the car and raced to the the closest Farm Project location, Chrysalis Vineyards, hoping to make it before the thermometer went any higher and another snow opportunity was lost. The temperatures were slightly colder out in the hills, and I had to wear fingerless gloves while shooting. The snow was still gently falling, sometimes barely a flake here and there, and sometimes the snow was swirling in front of the lens. It was a magical day to photograph the vineyard. The canes have been cut back, which is common practice in the winter, and as the temperatures start to warm up in the spring the new growth will begin. During my previous visit I learned that visitors can purchase eggs from the heritage free-range hens that are raised on Locksley Estate, the location of the vineyard. 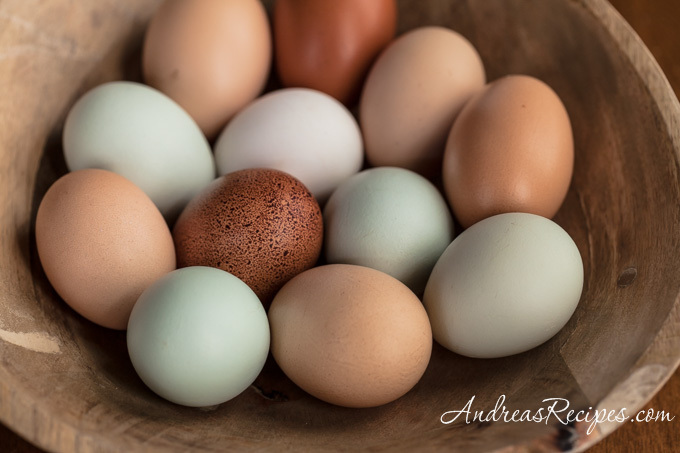 The owners have eight different breeds, including Delaware, New Hampshire, Ameraucana, Welsumer, Heritage Leghorn, Ancona, Black Copper Marans, and Rhode Island Reds, and I have to say that the eggs they produce are both beautiful and delicious. Our boys were fascinated with all the different colors and their comments were so cute. “Mommy, are these Easter eggs?” “Did the chickens paint these?” It was a teaching moment. 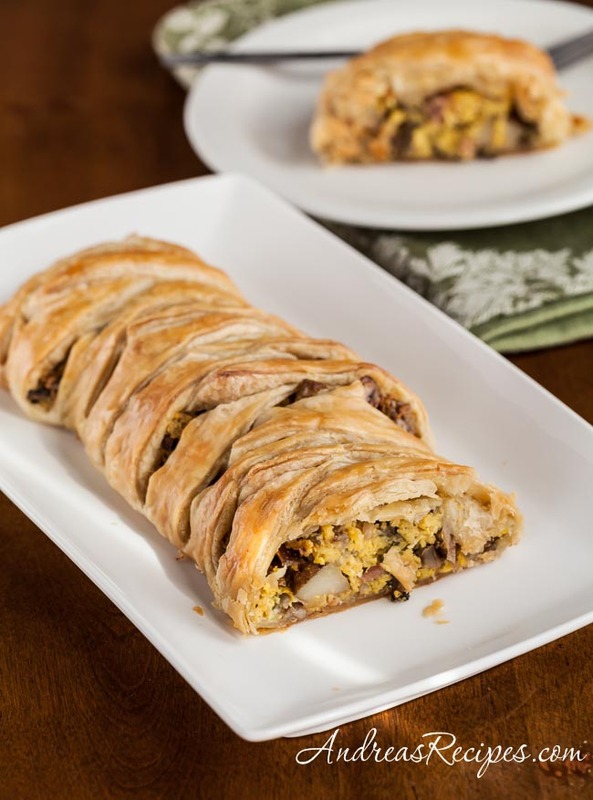 The eggs said breakfast to me, so I made a puff pastry braid filled with sautéed new red potatoes, mushrooms, shallots, ham, scrambled eggs, green onions, and a little goat cheese. The filling can really be whatever you want, swap the vegetables, use bacon, change the cheese, go vegetarian, whatever sounds good or is in your frig. Just be careful not to overstuff the braid. Brush it with a little egg wash before baking so it gets nice and golden and crispy, then serve it with fruit and a cup of tea or coffee or mimosas and you’ve got weekend breakfast. Place the oven rack in the middle and preheat to 375° F/190° C.
In the large skillet, warm the olive oil over medium heat. Sauté the potatoes until they start to soften, about 3 or 4 minutes, then add the shallots, mushrooms, and ham and continue cooking until the all the vegetables are tender and browned, about 6 to 8 minutes. In the small bowl, whisk the eggs and green onions together, then pour into the skillet and add the goat cheese. Scramble the eggs with the vegetables, just until the eggs are set, not dry. Remove from heat and allow to cool. Remove the puff pastry from the package and lay out on a floured surface. Roll into a rectangle 10 inches by 12 inches. 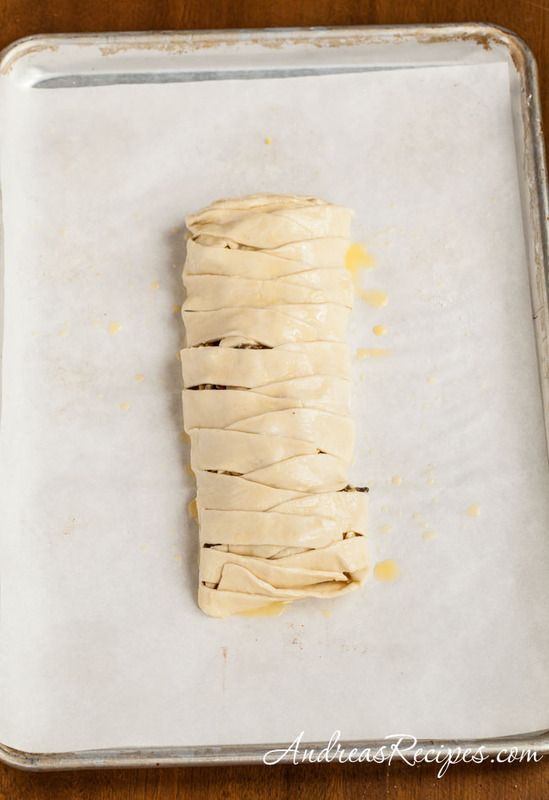 Fold the puff pastry in half and transfer to the parchment on a cutting board. 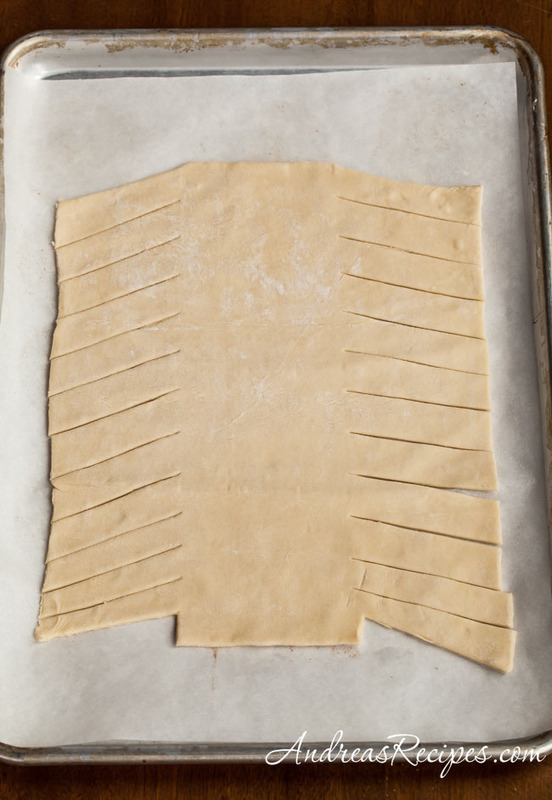 Using a sharp knife, make angled cuts all the way down the edges of the pastry evenly spaced approximately 1 inch apart. (This is approximate, as you can see below, mine aren’t perfect.) The center of the pastry should be about 4 inches wide. Trim the triangles from the top edges and the triangles from the bottom edges, leaving a short rectangle at the base about 4 inches wide. Transfer the parchment to the baking sheet. Arrange the filling on the puff pastry in the middle section, leaving space at the top and bottom of the pastry for folding. Fold the top edge over the filling and begin braiding the strips, laying them across the middle. When you reach the bottom, fold it over the filling and tuck the last braids under, trimming away any extra. Brush the braid all over with the egg white wash.
Bake in the preheated oven until the pastry is crisp and golden, about 30 to 35 minutes. Remove from the oven and allow to cool about 5 minutes, then slice with a sharp knife to serve. You can choose from a variety of fillings, just make sure not to overstuff the braid. This looks so delicious! I love breakfast for any meal and this is so wholesome, it could easily be served at dinnertime. Now I want breakfast for dinner! 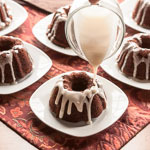 Great photos in this post, and it looks delicious too! Lovely photography and a beautiful breakfast recipe! Love the photos of the farms in winter. Rather than looking desolate, they look like they’re sleeping and saving their strength for Spring. 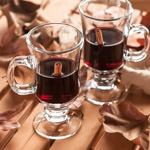 I’d love to make this for Christmas. Looks like you forgot to mention ham in the recipe list. How much would you recommend? Hello. I would like to know what I can substitute for goat cheese? Can I use pie crust instead? I would like to try this recipe for breakfast soon. Thanks – love your blog! More power! Hi Marisol, thanks for visiting. Yes, the recipe is very flexible, so you can use another cheese instead of goat cheese. Also, regular pie dough should work, but it will have a slightly different texture. Today I made this with asparagus, bacon, sliced red pepper, hash brown potatoes and cheddar cheese because they were all in my fridge. We enjoyed it at work this morning. This recipe is easy because you can substitute what you have and make it different every time.